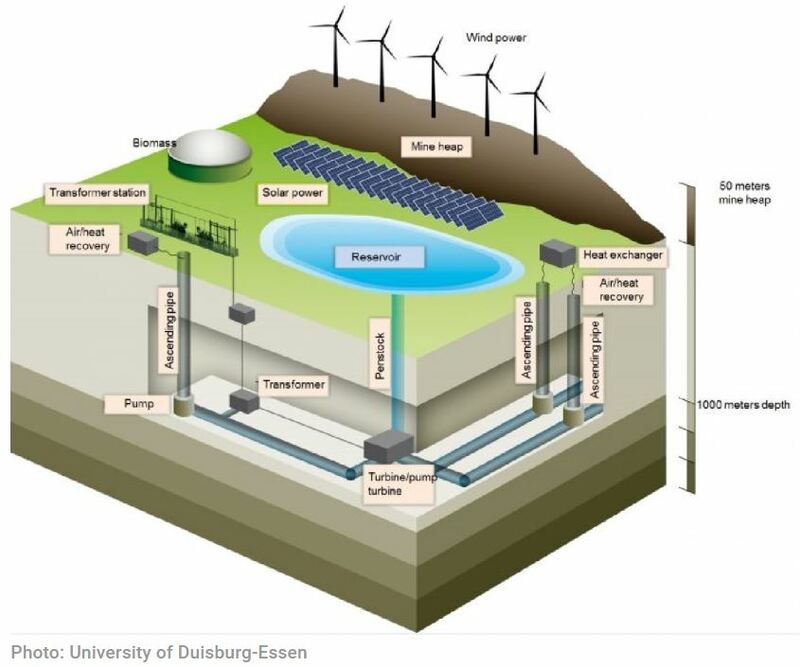 The consortium running the Prosper-Haniel project, which includes the University of Duisburg-Essen and mine owner RAG AG, are confident that the mine is suitable to become a storage pump. The plan to reinvent Prosper-Haniel envisages creating reservoirs above and below the closed mine, according to a blueprint posted on the group’s website. When needed to compensate intermittent wind and solar power, as much as 1 million cubic meters of water could be allowed to plunge as deep as 1,200 meters, turning turbines at the foot of the colliery’s mine shafts. The mining complex comprises 26 kilometres (16 miles) of horizontal shafts. Every new layer added also adds cost and inefficiency. Water table adulteration and pollution anyone ??? Oh and when the current climate fad has passed and they find they really need the coal, the mines will probably be irrecoverable. there has to be enough spinning reserve to cover the trip of the biggest generator on the grid. Dinorwig is rated at 1.65GW. The plant runs on average at 74–76% efficiency. Hinkley C is 1.6GWe per turbine additional coverage for turbine trip is therefore wise. The Glyn Rhonwy Pumped Storage scheme has been designed to bring new life to two dis-used slate quarries in the slopes of Cefn Du mountain in the Dyffryn Peris valley approximately 1.5km north west of Llanberis and 11km south east of the town of Caernarfon. The scheme will utilise two disused slate quarries; Glyn Rhonwy and Chwarel Fawr. This will provide an additional 100MW stor. Villages face the bulldozer as one of Europe’s renewable energy leaders leans more heavily on an old habit. Sounds a bit like frakking. Will they capture the released gas? And when they are done, renewables will still be intermittent. I know someone who worked on its construction. It was a beano for civil engineering contractors. This is not a terrible idea — excess wind power or solar, not needed in the grid during the day or during high wind periods, can be dumped into storage as pumped water. Huge amounts of power can be consumed running turbines “backwards” (as pumps) and the energy recovered later (with some losses of course, by allowing the3 water to run back down through the turbines — when the electricity is needed. There is a pumped storage facility near our Upstate New York location, which uses cheaper electrical rates to pump up, then produces power later when rates are higher. Kip – the point is this: ‘the state needs more industrial-scale storage as it seeks to double the share of renewables in its power mix to 30 per cent by 2025’. Without the renewables obsession the money could be saved and electricity costs kept lower. Somebody has to pay the bill for the scheme. Anti-fracking campaigners complain about the risk of polluting the water table. How pumping water into and out of an old mine can possibly be seen as a good idea is beyond me. Seems reasonable to me, assuming that it doesn’t cost a lot, which it shouldn’t, considering that the hard digging has already been done. But on the grand scale, things like this won’t make much difference because such opportunities are simply too few and too small. Sick of your phone running out of battery? Now you can use a mini water turbine to charge it up! The German design is already in demand from African communities wanting to generate their own hydropower. Maybe mass production will make it more affordable. “state governor Hannelore Kraft” The surname means “power”. Come on, this is all a joke, right?